Today was a big day for Apple. Not only did it introduce a cellular-enabled Apple Watch and an all-new flagship iPhone, it also revealed updated versions of the iPhone 7 and iPhone 7 Plus. The new iPhone 8 and iPhone 8 Plus are official. While they look similar to the iPhone 7 and iPhone 7 Plus, both models include notable upgrades. 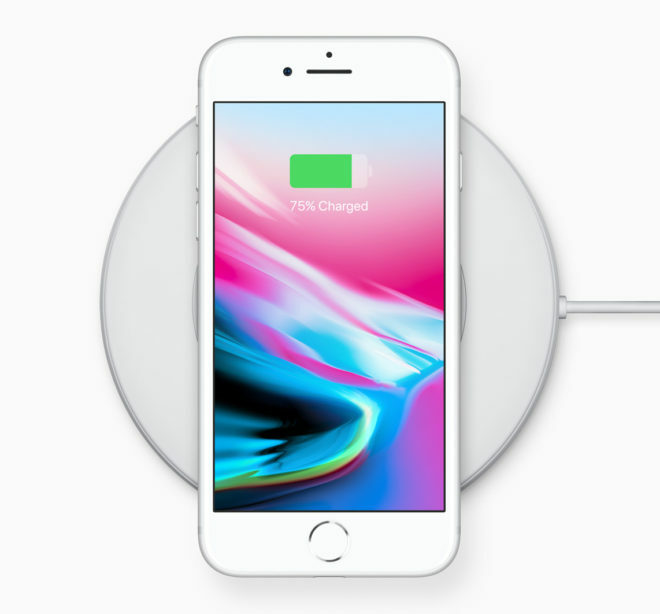 The iPhone 8 and iPhone 8 Plus feature glass on the front and back, which enables them to support Qi wireless charging. The cases of the iPhone 8 and iPhone 8 Plus also include an aluminum band that matches the color of the phone’s body. And Apple touts that both models have been microscopically sealed for IP67 dust and water resistance. 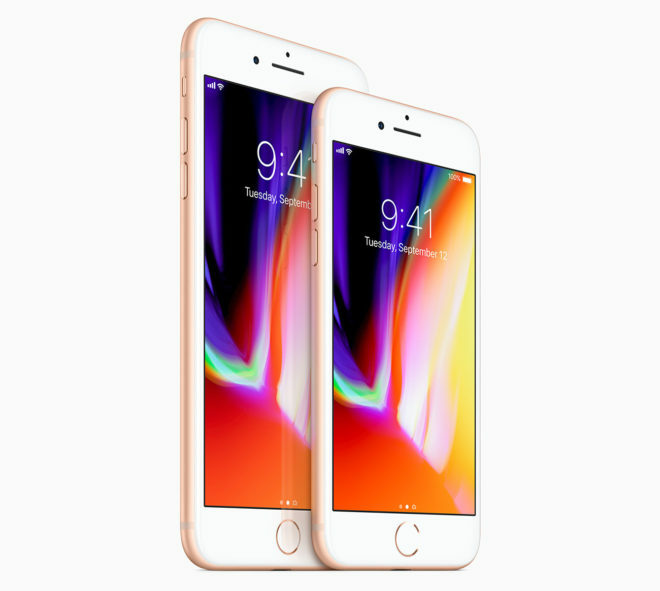 The screens on these models are similar to last year, with the iPhone 8 boasting a 4.7-inch 1334×750 LCD display and the iPhone 8 Plus packing a 5.5-inch 1920×1080 LCD screen. Both phones do include Apple’s True Tone feature, though, which adapts the screen color and intensity to your ambient light. These two new iPhone models also include stereo speakers, a Touch ID fingerprint reader below their display, and a 7-megapixel front-facing camera above the display. Around back, the iPhone 8 has a 12-megapixel camera with optical image stabilization. 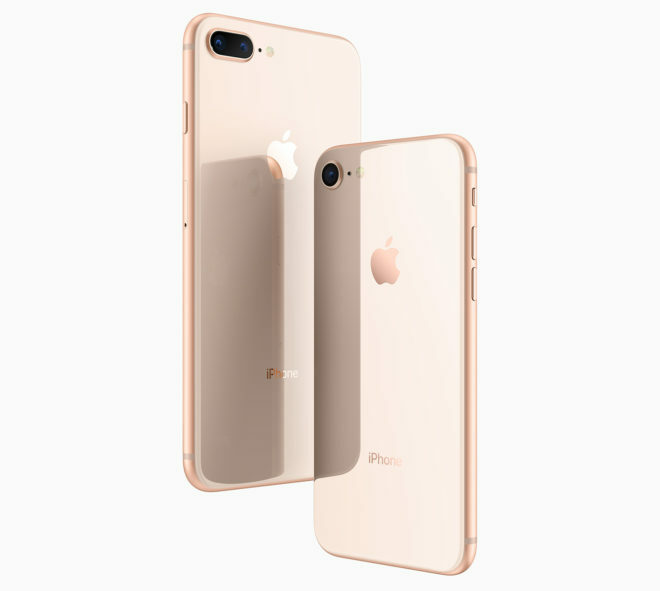 The iPhone 8 Plus has dual 12MP rear cameras, one wide angle and one with 2x optical zoom, as well as a Portrait Mode for bokeh photos and a new Portrait Lighting feature that’ll improve your bokeh images by helping you to give studio lighting effects to your photos. Both phones also offer 4K video capture at 60fps and as well as slo-mo 240fps video recording at 1080p. Inside both the iPhone 8 and iPhone 8 Plus is Apple’s A11 Bionic processor. It features a six-core design with two performance cores which are 25 percent faster than Apple’s A10 Fusion and four high-efficiency cores which are 70 percent faster than the A10 Fusion. Finally, Apple says that the battery life on the iPhone 8 and iPhone 8 Plus will be about the same as the iPhone 7 and iPhone 7 Plus, respectively. 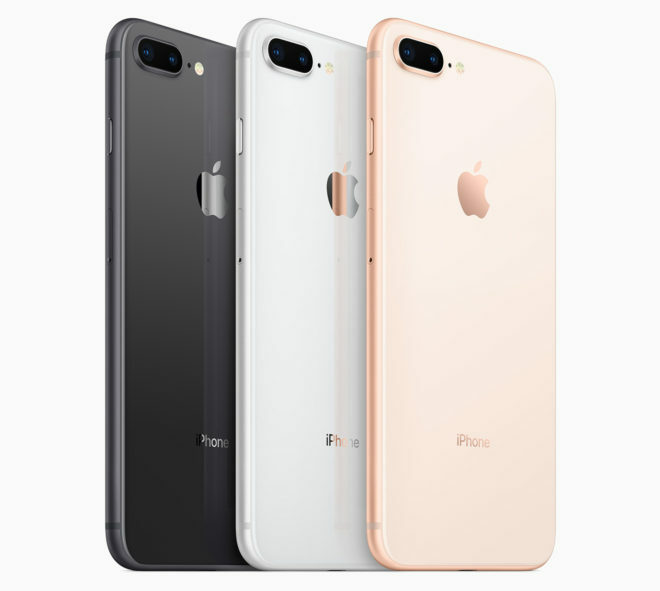 That means that the iPhone 8 should get up to 14 hours of talk time and 12 hours of internet use, while the iPhone 8 Plus should get up to 21 hours of talk time and 13 hours of internet use. Both the iPhone 8 and iPhone 8 Plus will be offered in Gold, Silver, and Space Gray. Storage options will include 64GB and 256GB for both models. Pricing for the iPhone 8 will be $699 for the 64GB model and $849 for the 256GB version, while the iPhone 8 Plus will start at $799 for the 64GB version and go up to $949 for the 256GB model. Pre-orders for the iPhone 8 and iPhone 8 Plus will begin on September 15th. The new phones will launch one week later on September 22nd. T-Mobile has confirmed that it’ll offer both the iPhone 8 and iPhone 8 Plus, but no pricing details have been revealed. T-Mo does plan to have a trade-in offer for the new phones that’ll let you trade in an iPhone 6 or newer and get up to $300 off (via 24 monthly bill credits) an iPhone 8, iPhone 8 Plus, or iPhone X on EIP. Looks like a regurgitation like every year. At least the X attempts to do something new. 4 generations of the same design? Yuck. No band 71 is a definite show stopper for me. As cool as 4x4mimo and 5G could be someday, it’s more that band 71 will actually bring coverage in some open areas and LTE to remaining Edge areas of Iowa, according to current vs end of 2017 coverage maps. Even though the area I live in has great coverage, I’m looking forward to the rest of the state having it and I’ll wait for it before upgrading my phone but it’ll need to be band 71 capable. Band 71 isn’t going to be fully deployed for 90% of the US until at least late 2018/2019. It does include Band 66 which actually does add some immediate coverage gains. Google censorship is pushing me to Apple. Yeah lots of bad on both sides but Google massive search manipulation & youtube play is unacceptable. They’ve crossed the line x2 can never be trusted. Nothing you would be interested in. You deleted response made yesterday replacing with current seeking attention. Well you got it , get a life lol. So What wouldnt I be interested in? & made you even more stupid looking for buying yesterday’s tech. I’m longtime smartphone geek 1st device HP iPaq 6515. From there Palm Treos , HTC WM junk , Blackberrys then Samsung Android everything. I’m burnt out , Many hours @ xda – rooting , building apps & thousandsss spent on hardware blah blah total waste making simple communication a chore. As far as Iphone , I’m tempted due to Googles search result manipulation & youtube censorship – playing politics. If not familiar with topic learn it. Anyway , I more then likely will GS7 until break then go simple Nokia phone. After GS7 breaks I’m thinking Nokia 130 running Series 30+ software platform. Phone / text & few apps will get job done 4 me. End result – lots $ saved & less time hypnotized by device. Will the new iPhone for T-Mobile again contain that questionable Intel modem? welcome to the nexus 4? My kids dropped the Nexus 4 on a table lightly and the back cracked. Everyone with a Nexus 4 that I knew, eventually had a cracked back. I had the Nexus 4 back when it came out. Never had an issue until my now 17 year old put it in her back pocket then sat down. Cracked the front screen. :/ I do remember some people posting, however, about the glass back cracking on theirs. will it hold a charge until next year? What? It can use wireless chargers that exist now. Next year is for the Apple branded wireless tri-charger that charges 3 things (presumably the phone, AirBuds, and an Apple Watch). an article said the wireless charger for won’t be available until next year. That’s correct. The APPLE BRANDED charger. The wireless technology used is Qi. The same as many other phones on the market today. If I put the iPhone 8/8+/X on my Choetech Qi charger it will wireless charge. In other words, you don’t have to only use the Apple branded charger. What am I not explaining correctly. but don’t you find it kind of humorous that apple couldn’t get the charger ready? I don’t find it anything. It’s typical of Apple.